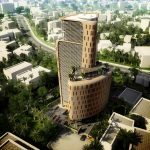 Capita Symonds has unveiled plans for a major new office development in Lagos, Nigeria. The Heritage Place scheme will be a landmark within Lagos combining striking façade design and top-end office space. The building, which will provide a new benchmark for office accommodation in the country, comprises 15,300 sqm of office space over eight floors; 390 car parking spaces over six floors; and a ground floor lobby with meeting rooms and café. The proposed form and layout have been developed in response to the brief and planning requirements and the relatively constrained site geometry. The building will also be LEED rated to certified or higher.